Featured presentation of AutismOne 2018 Conference to address retroviruses and suramin in May 2018. 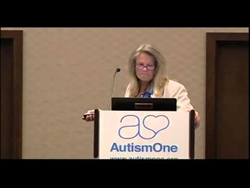 AutismOne today announced that at the 2018 event, Dr. Judy Mikovits will explain complicated details of how retroviruses in today’s biological therapeutics, including vaccines, are contributing to autoimmune disease, neuroimmune disease, and cancer, chronic inflammatory diseases that have been skyrocketing in incidence in the past quarter century. Dr. Mikovits has spent her adult life studying how retroviruses contribute to these diseases. Many factors are important in the development of diseases associated with retroviruses, such as the expression and mode of transmission being key to disease development. Dr. Mikovits has learned a great deal about the types of diseases from approximately 40 years of study. Suramin is an old drug with 75 years of use in humans, and suramin was known to be a potent antiretroviral before HIV was isolated. Dr. Mikovits worked for more than 20 years at the National Cancer Institute (NCI) developing treatments for retroviral associated cancers and HIV/AIDS. She led the Lab of Antiviral Drug Mechanisms of the National Cancer Institute’s Developmental Therapeutics branch. Dr. Mikovits first worked on suramin in the Biological Response Modifiers Program of the NCI between 1983 and 1987, at which time it was found to have potent antiretroviral activity against HIV. Interestingly, suramin was shown to be most potent against the murine leukemia virus-related retroviruses in 1979 and 1986. [1, 2] Dr. Mikovits started her work with this knowledge in HTLV-1 in 1980 before there was an HIV or AIDS. May 23-27, 2018, is the time for the event titled AutismOne 2018 Conference: Say “YES” to Recovery, which will be held in Chicagoland at the beautiful Westin Lombard. Attendees of the AutismOne 2018 Conference will hear about how suramin has had positive effects for those with autism and other conditions. For more information and to register, please visit http://www.autismone.org.